The Smart Green Shipping Alliance is an award winning, collaborative, multi-disciplinary organisation committed to building commercially, technically and environmentally superior renewable powered ships and shipping system solutions. The SGSA owns the design of sailing hybrid merchant ship externally validated as using ~50% less fuel than comparable conventional powered ships. The Smart Green Shipping Alliance addresses the economic and environmental challenges facing shipping by creating A WHOLE SYSTEM SOLUTION that is commercially irresistible to targeted cargo owners and aims to be 100% renewable powered and zero waste. We provide long term fixed price ‘logical logistics’ shipping service to end-users. 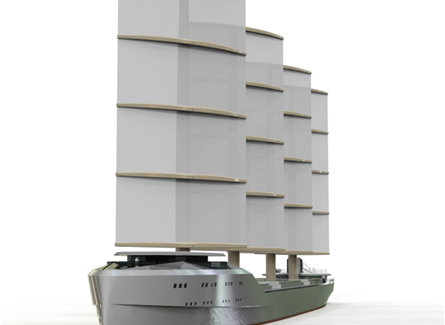 Smart Green Ships are 21st century small (up to 25000 tonnes) sailing hybrid cargo vessels. They combine proven soft sail technology adapted to an industrialised automated square rig sail system known as the Fastrig, with an off-the-shelf Rolls-Royce LNG Bergen engine powered by waste derived liquid biomethane (LBM). Up to 50% of the propulsion comes from wind.